One News Page United States > News Videos > Reality Check: What is t he state's minimum markup law? Reality Check: What is t he state's minimum markup law? Chief Political Reporter Jessica Arp takes a closer look at the minimum markup law and Gov. A key part of governor evers plan -- includes a rollback of the state's minimum markup law on fuel. 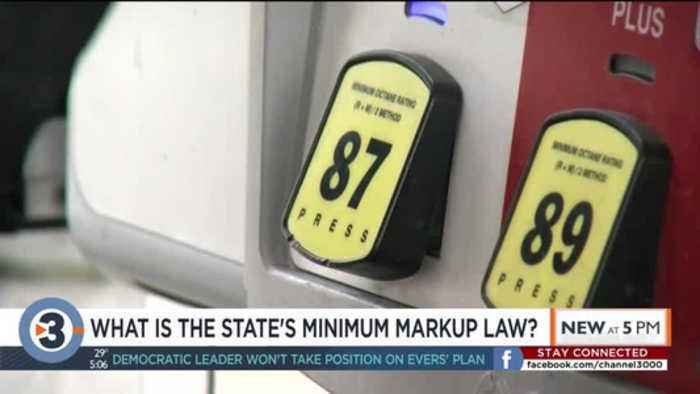 But what exactly is the minimum markup law, and how does it impact gas prices? Political reporter jessica arp has tonight's reality check. The measure is technically called the "wisconsin unfair sales act"... but it's become known over the years as the "minimum markup law." Passed in 1939... it's aim was to stop businesses from artificially selling items below cost... known as a "lost leader"... in order to get customers in the door... and drive a competitior out of business. So, the law prohibits selling anything below the cost the seller paid... calling it "a form of deceptive advertising." When it comes to motor vehicle fuel.. The law defines the "cost" of gas o diesel to also include the cost of doing business for the seller. That includes things like taxes, inspection fees, and transporting the fuel. What kind of cost does that add? Today... the current terminal or wholesale price for gas is a dollar-79. Added to that price is 18.4 cents for federal taxes... 30.9 cents for the state gas tax... which is what evers also wants to raise. Those cost of doing business fees are two cents for inspection fees... two and a half cents for transportation. That means a minimum price of 2-32 to get gas... the average retail price in madison for gas today is 2-34. There can also be an additional 9 percent markup from there... but retailers are allowed to "meet competition"... meaning i someone marks gas down... say near the stateline... everyone in the state could match price to mark down. Meaning gas could cost less than the minimum price. The key question that will be discussed in the coming months is whether repealing this measure could hurt retailers. The state's petroleum marketing association says it will eliminate local competition with big box stores... while the state's free market advocates have been arguing this solely inflates the cost of goods for consumers.